5. Well sold in USA, Australia, Germany, etc. 1. Order raw material based on customers' request. The finned tube provide by us is Extruded Type, which is different from the ones through HF Welding and Wrapping method. The fins are obtained by roll forming the outer surface of a soft seamless plain tube. The technology simply squeezes the wall thickness transforming into straight fins on the tube. So the fin and the tube are integrated and inseparable, which avoids the heat resistance between fin and tube, and optimizes heat exchange efficiency. Based on this structure, the Extruded type can survive more severe working conditions than other finned tubes. Also it, on the other hand, shows several unique features such as enhanced physical structure, resistance to vibration, anti-corrosion ability, and long service life, etc. Under this technology, there are two major types of finned tubes available with us, Single metal tubes and Bimetallic tubes. The former uses Copper, Aluminum, and Copper Nickel alone. The later has a core tube on the inside made of harder material. In this case, the outer tube is rolled onto the core tube in order to provide for a tight bond and good thermal contact between the two tubes. 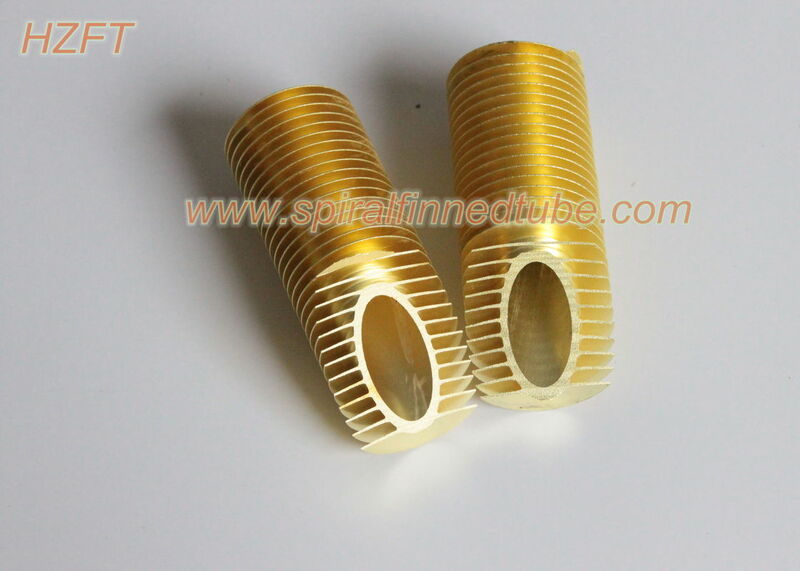 Customized finned tube is available. The specification table is followed below. If required, the fin tube can be made into various forms after soft annealing process. They can be used for cooling and heating in a large scale of conditions. For example, coils in water heater, oil cooler in large machines, heat transfer part in boiler and heat recovering system, air-conditioning and refrigeration industry as condenser part or evaporator part, etc. The material for our fin tube covers Copper(C10200, C12000, C12200), Copper Nickel(C70600), Aluminum(1060), Aluminum alloy, Aluminum-Steel(bimetallic), Aluminum-Stainless Steel(bimetallic), Aluminum-Copper(bimetallic), Aluminum-Copper Nickel(bimetallic), Copper-Copper Nickel(bimetallic). The fin tubes are mainly used in heating(gas-fired boilers, condensing boilers, flue gas condensers), in mechanical and automotive engineering(oil coolers, mine coolers, air coolers for diesel engines), in chemical engineering(gas coolers and heater, process cooler), in power plants(air cooler, cooling tower), and in nuclear engineering(uranium enrichment plants).